There are many different types of travel organizers available but they all have the same purpose, i.e. to make packing less of an ordeal. Travel organizing systems allows you to make better use of the limited space in your bag. You can fit more in your luggage and your belongings are better protected. 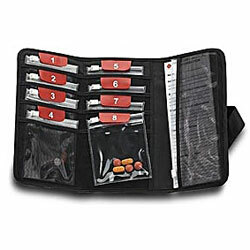 Packing organizers help you to stay organized when packing, as well as when travelling. Travel packing systems include travel organizers in different shapes and sizes. There are number of travel packing brands available. The look and quality varies but most work on similar principles and include similar type of products. Popular travel packing aids include packing cubes, packing folders, packing sacs, shoe bags, gadget cases, toiletry kits, cosmetic bags, medicine cases, travel bottles, jewelry cases, tie holders and compression bags. 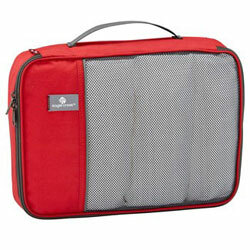 Packing cubes are fundamental part of any travel organizers system. They come in many sizes. Single and double cubes are most common, but you can also get smaller cubes, i.e. quarter and half cube. Having different sizes is very convenient and allows you to maximize the available space in your bag. The best packing cubes have a mesh top for visibility and breathability, i.e. to keep moisture in or out. Packing cubes can be one or two sided. Double-sided cubes are great if you want to separate clean and used clothes, or dry and wet, as one side has breathable mesh top and the other spill proof mesh top. We own three packing cubes and we use them on all our travels. We actually also use them when back home as they fit nicely into our drawers and are great for storing loose items. When travelling we use our cubes for storing socks, underwear, various loose items, and smaller clothing items, like t-shirts. We have also used one cube for all the electronic cables and chargers we need on our travels. Packing folders are great for your formal attire and other items that are prone for wrinkling, e.g. shirts, trousers, dresses and jackets. They are understandably popular among business travelers and others that travel frequently with their formal attire. Packing folder allows you to pack more as the items are neatly folded and compressed in the folder. They come with useful folding instruction board, which makes the folding easier and helps minimize the wrinkles. Packing Folders come in different sizes and can hold between 7 to 15 items. 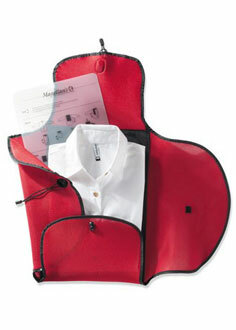 You can also get Garment Sleeve, a full-length packing folder that holds up to 2 long dresses or suits. We own one packing folder. We use it less than our packing cubes but always on business trips and when travelling with clothes that are prone to wrinkling. Packing sacs are useful for all the small stuff most of us tend to bring on our travels. They help you to keep those small items organized and the spill proof mesh is very practical if travelling with liquids, e.g. sunscreen. The best travel organizers sacs have strong carry clip to allow you to hang it up, as well as pleated bottom, allowing you to place it upright on counters. Shoe bags are ideal to protect your clothes from dirty soles. There are many different types of shoe sacs available. Shoe bags made of fabric are the simplest one. They do protect your clothes adequately, as long as your shoes are not wet. Leather shoe sacs are the most luxurious type of shoe bags. Good quality leather shoe bags usually come with lot of extras. They may be extendable, come with separates to prevent the shoes rubbing together, have special ID tag, TSA combination lock, accessory pockets, etc. However, the most popular shoe bags now tend to be zippered, spill proof, mesh-laminated shoe sacs. They are light, easy to clean and even wet shoes cause no problem as they are spill proof. You are spoiled for choice when it comes to toiletry kits and cosmetic bags. They really come in all shapes, sizes, and colors. However, practical toiletry organization should be the key in all designs. There should be lot of different size compartments and zipped pockets, i.e. offering the right space for every toiletry item. It should have convenient carry handle and you should be able to hang it up if you prefer, e.g. to free your hands. The internal and external material should be water resistant and easy to clean, as spilling is common when travelling with liquid toiletries. You can also get special travel bottles, i.e. in the right size for going through airport security. We have owned number of Toiletry Bags over the years. Currently we tend to take our Eagle Creek Slim Kit with us. If you have to travel with medication, then you should seriously consider special medicine kit, i.e. to keep your medication safe and dry while travelling. You can get special medicine cases that allow you to keep your medicine chilled while travelling, e.g. to protect insulin and other temperature sensitive medication. You can also get special pill travel organizers, i.e. with individually labeled removable pouches with slide locking closures that are color coded to separate your day- and nighttime medication. We are increasingly travelling with gadgets, which mean we need to pack / protect them when travelling. There are all kinds of bags and covers available for your electronic gadgets, from laptop bags to all kind of covers and sleeves for tablets and smart phones. Then there are special electronic cases available to help you to keep the small portable electronics organized and protected while travelling. Interior padding protects the content and adjustable dividers allow you to customize the internal space as suits you best. You can also use them for storing all the electronic cables and charges. Another option is to use packing sacks or even packing cubes for that (we usually use one of our packing cubes). You can get various specialized travel organizers, e.g. for jewelry or ties. You can usually do without specialized packing organizers but they do protect your belongings better as they are purposely designed. 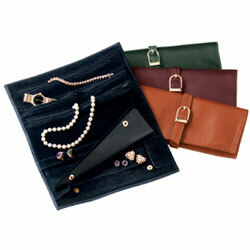 Jewelry packing organizer for example will keep your jewelry protected and tangle-free, which is very beneficial. While tie case protects your ties and keeps them wrinkle free when travelling (the best one have small accessory pouch for storing cufflinks). Sometimes called the packing secret weapon as you can get up to 80% more space if you use compression bags when packing. Compression bags are very popular among backpackers as they allow them to shrink their bulky items down to the fraction of their size. However, more travelers could benefit from using compression bags. They are essential travel packing aids when space is limited and / or you need to travel with lot of stuff. Check out B for Bag selection of Packing Organizers or check out some of our favorites below. 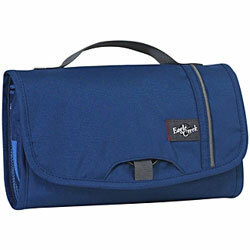 We have used packing organizers from the Eagle Creek Pack It system range. We are very pleased with our experience and therefore comfortable recommending the Eagle Creek Pack It system for those looking for good quality travel organizers.